Call me photo addict but me and John love capturing our kids every little moments. This will be our greatest treasures when they're grown up and have their own lives. You know, they can't be kids forever and we have to accept the fact that sooner we will go back to being just us. Kinda sad to think about it but I am preparing myself to it. Time flies so fast and so is the children's growth. Here's a snapshop of my daughter at the veranda of the cable car station at Mt. Seorak. Here's Rylie and EJ at the hotel lobby.. Here's us with some Korean hikers! She started potty training before she turned one, now she's completely potty trained (got done using training pants when she was 2 1/2 years old). My son would cry everytime I try to put him in his potty. I think boys are harder to train compared to girls, do you agree? both passionate about nursing. Rylie nursed with me for 18 months until EJ was born so I have to wean her which she refused so much. EJ is 17 months old now and still nursing. Other people often asked, how can you let them.. I just tell them that I enjoy it too! I can say that our 5th wedding Anniversary was very memorable because it was celebrated in the Mountain with our kids. 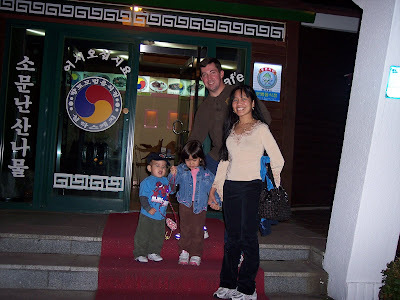 We left Chinhae on October 11 at 8 am and it was a dreadful 7 hours long drive... Here are some photos taken in the bus (am not in the pic, photographer ang role ko lol)..
Then we stopped at Sokcho Fish market where we devoured on some tempura shrimp and sushi.. Here are some snapshots: We arrived at the hotel around 5 pm, we slept early after taking shower and dinner.. Man that hotel was so hot, there's no ceiling fan or lampshades, weird huh.. the heating and colling runs on the floor. Oh we had a funny experience dining out because our original plan was to go out and eat at a Korean Resto so we asked the hotel desk clerk to help us find one, so he made some phone calls and finally he wrote something on a paper and told us to just handed it to the taxi driver. When we arrived there, no one understand what we are talking about and we can't understand what they are trying to tell us either, so we just left... lesson learned, never go out without an interpreter hahaha.... But of course to make it memorable, i have to take a pic lol..
For the breath taking scenery of our hike, just click on this link... Alrighty guys, thanks for reading! 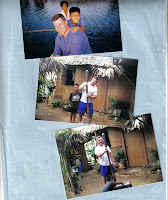 This was my husband's first time visit in our munting bahay kubo (shanty). We let him try pounding (bayuhin) the soaked rice by using wooden mortar and pestle. This is the old tradition way of making the rice turn into a flour. Hubby like maruya or banana fritters (am i right, am not sure lol) so before sya pakainin dapat papagtrabahuhin muna lol.. But anyhow, he ended up having blisters on his palms hahaha..But he said that he liked and enjoyed it so much! Pardon readers, for some reason my mind is not functioning well today so there's a lot of wrong grammars to this post hehehe. Am sleepy kasi lol. PEACE!